This is an important SEO Blogger trick to increase SEO. Heading tags have a great importance in Search engine results, Heading tags helps Search engines to recognize what is important in your blog.Heading are form H1 to H6 .H1 tags have higher priority.So we are going to hack blogger template by changing H3 tags to H1 tags. 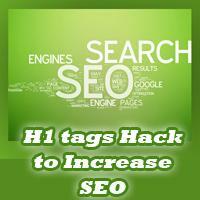 By default blogger post title is in H3 tag,here is a trick to change it to H1 tag for more SEO. Done ..Wait for few weeks you can find the change in Google SERP. Your Blog pages will show in Google Search Page. Update [21.06.2014] : I have noticed that this trick displays error in some webmaster like Bing. If you get error message from the webmaster then change the H1 tags which we changed before to H2. Note: Only change the H1 tags you changed earlier. Google Webmaster will not show error on this trick.